It was said that long ago, native Indians called the springs, located on a hill five miles north of Suisun City, “The Land of the Healing Waters.” This was to become the site of Tolenas Springs (a.k.a. Solano Mineral Springs and Suisun Soda Springs), a famous Solano County landmark for many decades. It all began in 1855 when marble was discovered on that hill. This land had once part of a Mexican land grant, “Las Tolenas Rancho,” which was purchased in 1837 by Jose F. Armijo. It was named for the Tolenas Indians, a small tribe of Patwin Indians who inhabited that place for many thousands of years. After marble was discovered, the Suisun Marble & Quarry Co. was formed and the quarried stone was shipped by schooner from Suisun City to San Francisco and points beyond. “About four miles from town (Suisun City) in the hills between the Suisun and Laguna valleys is a lime and stone quarry. The stone that cannot be used for building or ornamental purposes is turned into lime. The company employs some 10 or 15 men, mostly Chinese, in the quarry. In 1860, a correspondent from the Sacramento Daily Union traveled to the quarry. In 1858, Judge Thomas Swan purchased the property and was developing a resort above the quarry. In 1859, the resort was written up in Hutchings’ California Magazine. According to the article, there were four springs providing curative waters: White Sulphur, Empire, Congress, and Seltzer. According to reports, the water from Seltzer Spring was the best. Swan continued to develop the resort for the next 20 years. 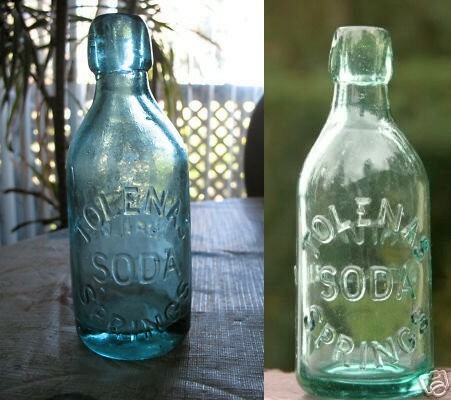 The bottled water was marketed into the early 20th century. Most of the visitors were local. In 1883 it was the chosen spot for the Solano Pioneers Picnic, a May Day event. The quarry was also still in operation. In 1884, the directors of a new corporation, the Tolenas Mineral Water & Onyx Co., were talking of building a steam works to saw out the slabs of onyx. At some point, the main spring of curative waters, which at one time spouted water 10 feet in the air, was disturbed by a dynamite explosion. From then on the water simply flowed down the hill. In 1960, Ray McRoberts, a jeweler, became the owner of the Tolenas Quarry Co. and contracted with a small group of American Indians to do the mining. At the time, the marble was used mainly for building material. The pit produced seven different colors of what is commonly called Italian marble. There was white onyx and black onyx. The latter is rarely found the United States, and favored in jewelry making. The water was also said to cure diseases of the urinary organ as well as malaria and was greatly effective for hangovers. Even in the 1960s the water was finding converts. The Indians, who were working the quarry, would wash their cuts in the water and claimed those cuts healed in a day’s time. But not all those who came in contact with the waters were enthralled. At one time a local rancher had his cattle grazing in the pasture land. He had 38 cows pregnant and every cow lost her calf.